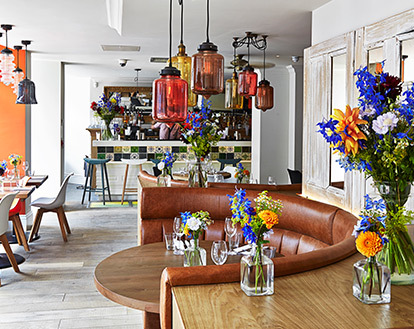 Fabulous ethically sourced, sustainable British produce served in an atmosphere of stylish informality. From 12:00 to 10:30 pm, and be it business, pleasure or special occasion, there is something to suit your appetite. And watch this space for news of our spectacular breakfast menu, soon launching for King’s Crosses hungry early risers. And don’t forget our drinks list. Join us at the bar for one of our creative cocktails – made using only the freshest ingredients. Or enjoy something from our international & unique selection of wines, beers and spirits all bursting with a variety of English, biodynamic, carbon neutral and traditional choices. Fill in your details below to recieve our latest news and offers straight into your inbox. @londoneating @TwizooLondon Come on down, our Aylesbury Duck Breast with orange & Juniper & scrummy Eton Mess are calling you! T.E.D Restaurant has grown out of Think.Eat.Drink, a groundbreaking membership initiative which changes the way the food and drink industry approaches its supply chain – embracing those who wish to think, eat and drink more ethically. T.E.D is the result of the long held dream of Jamie Grainger-Smith, an influential and innovative restaurateur, whose career spans more than 22 years. 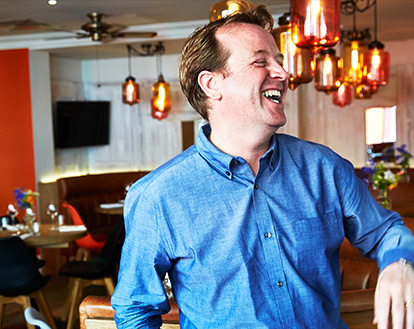 He has played key roles in the evolution of iconic restaurants such as Fifteen with Jamie Oliver, The River Cafe and Alastair Little Restaurant in Ladbroke Grove. He also co founded the much acclaimed Acorn House and the Waterhouse Restaurant in Hoxton. 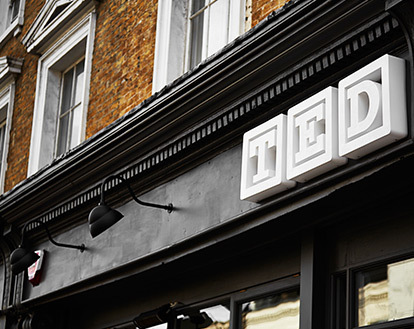 T.E.D aims to deliver a unique atmosphere: clients will enjoy a stylish and relaxing restaurant experience where consistently delicious seasonal and ethically sourced Modern British food is served. 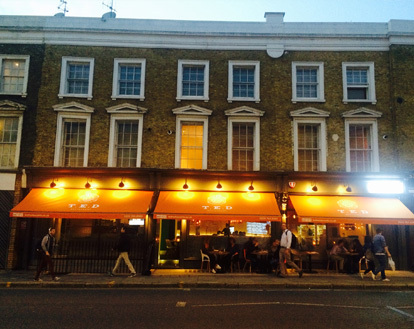 At the same time, with its easy access location in the thriving Kings Cross community, T.E.D is a place where people can get together to eat, drink and catch up away from the crowds, bang in the centre of London. The T.E.D Community is a dynamic new initiative, which aims to lead a fundamental change within the food and drink industry by supplying and sourcing from each other – those who want to eat, drink and think more ethically and profitably. T.E.D Members join an approved network of leading hospitality companies and as part of this membership can showcase their products and services to like-minded companies who are eager to embrace the future of food and drink. Our striking setting has been designed and built to the highest standard using sustainably sourced fixtures and fittings and salvaged furniture with our contractors handpicked for their eco-sensitive practices. T.E.D. consultancy was established to provide a step change in the world of food and drink. Notably, it has built a substantial track record working in partnership with statutory providers and commercial organisations such as London Legacy Development Corporation (formally OPLC), Greater London Authority, Ealing Council, Hastings Pier & White Rock Trust and The Camden Society. The consultancy service provides guidance, advice and support to the food and drink industry. It offers a total solution, from concept creation through to final delivery, including feasibility reports, business plans and ethical procurement and design. T.E.D Events provide an event management service that incorporates a range of locally sourced food menus and a range of biodynamic wines together with experienced and well-trained staff with all the knowledge and expertise needed to create a truly unique occasion. From private parties, to product launches and charity dinners, we can help bring any vision to life. T.E.D Events helps you ‘go greener’ by championing the best local suppliers, growers and small organic producers without compromising on quality. 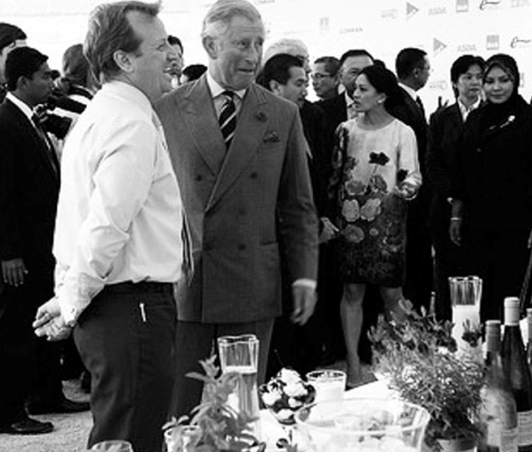 T.E.D Events have, in the past, created a pop-up restaurant in collaboration with The Prince of Wales Charity Start UK within Lancaster House. The Terrace Restaurant and Bar were open to members of the public for free to enjoy the exquisite surroundings and showcase the very best sustainable food including homemade Scotch eggs and pork pies with piccalilli. T.E.D Members join an approved network of leading companies. This provides them with a platform for showcasing their products and services to like-minded organisations eager to embrace change in the future of food and drink. Eating and drinking at T.E.D. is special. At the heart of our menus are impeccably sourced British ingredients served with imagination and flare. 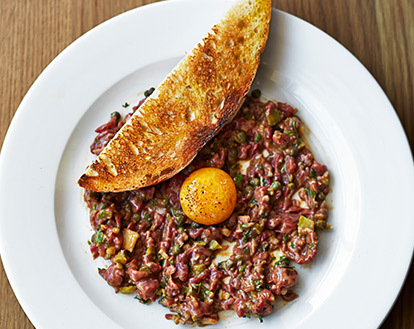 A standard menu is enhanced on a daily basis by a selection of special dishes which take the best produce available and turn it into something unexpected, like our deliciously fresh, sustainably reared Black Bream, served with homemade gnocchi dumplings in a heritage tomato vinaigrette; or Somerset beef steak tartare served with toasted sourdough and a single fresh, free range egg yolk. What’s more our open plan kitchen, and live kitchen cam allow you to watch the entire transformation! Similarly, our international wine list from responsible suppliers is bursting with a variety of biodynamic, carbon-neutral and traditional choices. Take a look at our offerings, from the bar, a balanced selection of organic spirits and mixers alongside a creative cocktail menu using the freshest of ingredients. Both the upper and lower floors of T.E.D Restaurant, either individually or combined, are available to hire for private parties. What’s more, our in house Events team, characterized by their highly personal and creative approach, is on hand to ensure your function happens exactly as you had imagined.